The First Vogue or Other Fashion Magazine You Bought? Discussion in 'Magazines' started by balmain1914, Aug 14, 2009. Well,I live in a poor country and it's extremely hard to buy foreign magazines. And that's first time I saw Queen Anna's signature,too bad.An that's first time I feel how commercial this version of VOGUE is. But lucky me,there are few articles are about Balmian and Roland mouret,also Raquel was doing some editorials wearing haute couture. So,why not share your first feeling when you got the first VOGUE magazine? the first and only US Vogue that I purchased... i still have it. and this is the first Vogue Italia that I purchased. Will some articles be translated into English in VOGUE Paris and VOGUE Italia? OMG! me tooo! i was in 3rd grade or something. don't know where it is now though. i brought it to school and got all wrinkly coz my girlfriends borrowed it. First Vogue I've bought was Vogue Russia July 2008 with Natasha Poly, but after that I've bought older issues than this, but first was exactly this issue. My first was Vogue Paris June/July 2008 with Noémie Lenoir on the cover. I think this thread should be renamed "First fashion magazine you bought in your life"...Vogue is a little bit limited..
#9 neely,your birthday is in September?Wow,that's January in fashion and Vogue is double size in that month(almost?). the first Vogue that i bought was February 2002 issue of US Vogue with Sarah Jessica Parker on the cover. while for other editions, the May 08 issue was my frst Vogue Italia and March 05 was my first UK Vogue. Oct. 08 was my first ogue Espana. The March 2005 issue of UK Vogue was my very first Vogue. I still remember to this day, seeing it on the newsstand. Unfortunately I was very stupid back then and cut it all up for the logos from the ads. Only the cover remains in pristine condition. Kate looks so pretty on that cover. I cant find photos of either of the ones I think were my first, but it was either Gwyneth Paltrow on the cover of UK Vogue, up-close shot, she's smiling big, short blonde hair, or the other one was Claire Danes on US Vogue, its actually a really nice cover, she's sitting in a field, full body shot. This had to have been 1997. That was my first August 2004 Vouge Paris. I was 11; I think. I was stupid and cut it all up but I pulled the cover off and it's still safe but the rest is in tatters. I lived in a smaller city back then so I didn't have access to good magazines really, but this one I ordered online. 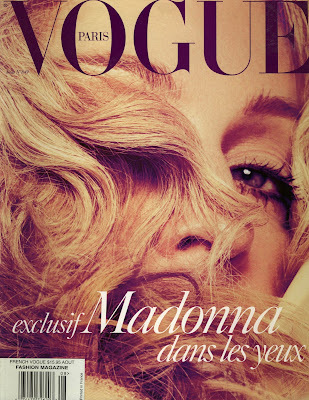 That's when I fell in love a little with Vogue Paris.